The best plants for hummingbirds are those that have tubular flowers. Hummingbirds have the perfect apparatus; their long slender bill houses a very long tongue, capable of retrieving nectar from even the longest of blooms. 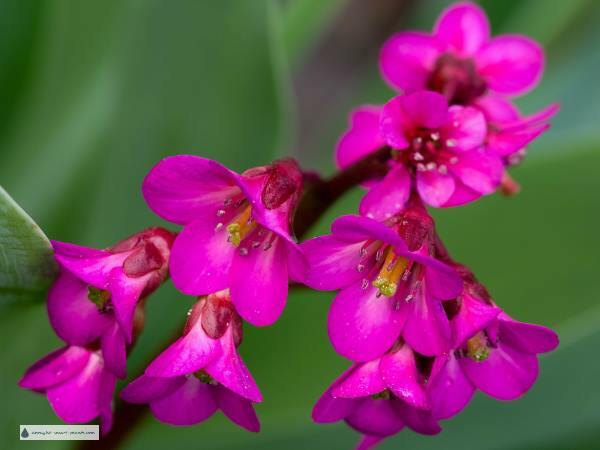 Bergenia cordifolia flowers in clusters on a thick succulent stem in the spring. With its common name of Pigsqueak, you wouldn't think it would attract hummingbirds, but as it blooms so early, it's a great magnet for those flying through on their way to northern areas to nest. It's not essential that they are red, but hummingbirds do display a lot of interest in that color - they check out my snowshoes (red plastic - no nectar there!) and anything else that looks interesting. They are also very easy to get habituated to feeders - they curiously look in the window, and hover at wind chimes as though they wonder how to get nectar out of them. 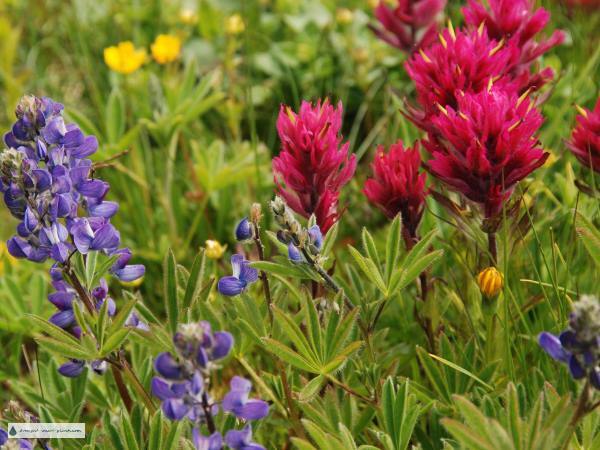 Castilleja is the Indian Paintbrush, which blooms in many shades of red and orange. As a saphrophyte (a parasite on the living roots of other plants), it is difficult to transplant; if you're lucky enough to have these hummingbird magnets, try and keep them happy. The best hummingbird attracting flowers will open in sequence, starting at the bottom of a long raceme or spire. 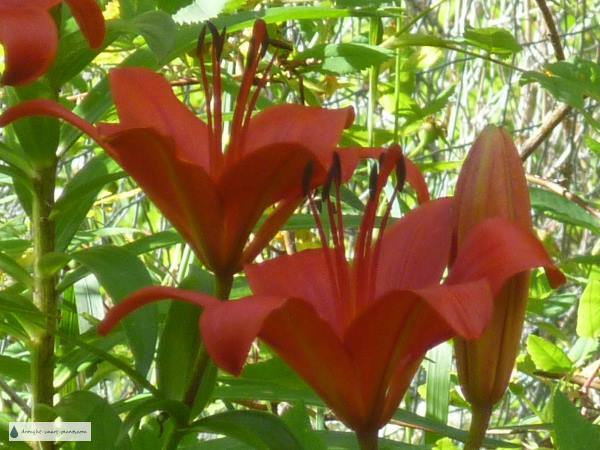 Many Lillium species have new blooms opening continuously over several weeks to make sure the pollen and nectar is available for a long season. 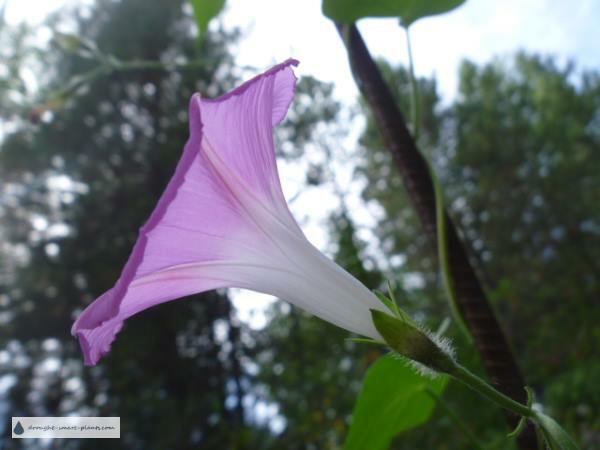 Wildflowers provide the best nectar for hummingbirds, providing them with all the nutrients they require. 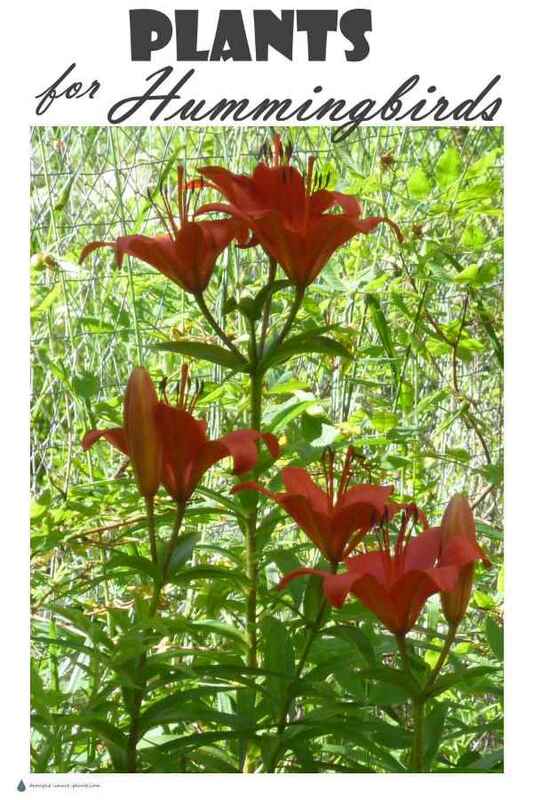 Many Lillium species, both wild and domesticated, are attractive to hummingbirds. Their tubular throats are rich with nectar, and the blooms last for a long while and there are usually several on each stem opening in sequence. We like to think they need us for filling hummingbird feeders but they actually get all the nutrients they require from flowers blooming in the wild. Their preference is for Lonicera (honeysuckle) both bush types and the scrambling vines, some of the wild orchids of damp meadows and the wild Clarkia and Epilobium or fireweed and the Indian Paintbrush, Castilejea as well as many others opening in sequence throughout the nesting season. 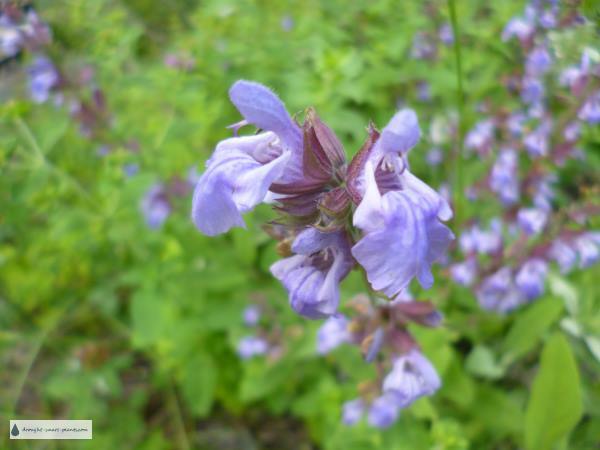 Many nectar plants belong to the mint family - look for square stems to give away their affiliation. These are all rich in nectar, attracting not only hummingbirds, but other pollinators too. Hummingbirds will be attracted to many perennial xeric plants that you might already have growing in your garden; Bergenia cordifolia, Monarda didyma, Penstemon, Aquilegia, Lobelia cardinalis, Campsis and Campanula as well as many herbs like Oreganum and Salvia species. Annual plants that particularly attract hummingbirds are Ipomoea, morning glory vines, petunia and Pelargonium, the ornamental geranium. Any flower with a trumpet shape will attract hummingbirds, although the myth that they're only attracted to red isn't true - although they're partial to red and pink shades, they also like white, blue and purple flowers too. Grown in containers they will flower in profusion and draw all the feisty little jewels in the neighborhood. Houseplants on a deck or patio for the summer can be a magnet for these fascinating pugnacious birds. 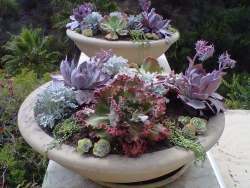 A fight will break out over the tall flower spikes of Aloe if you can convince them to bloom. A nectar corridor of blooming plants of all kinds will benefit not only hummingbirds in their search for nectar, but many beneficial insects and pollinators too.